This is a review lesson. Keep it simple, fun and activity based. 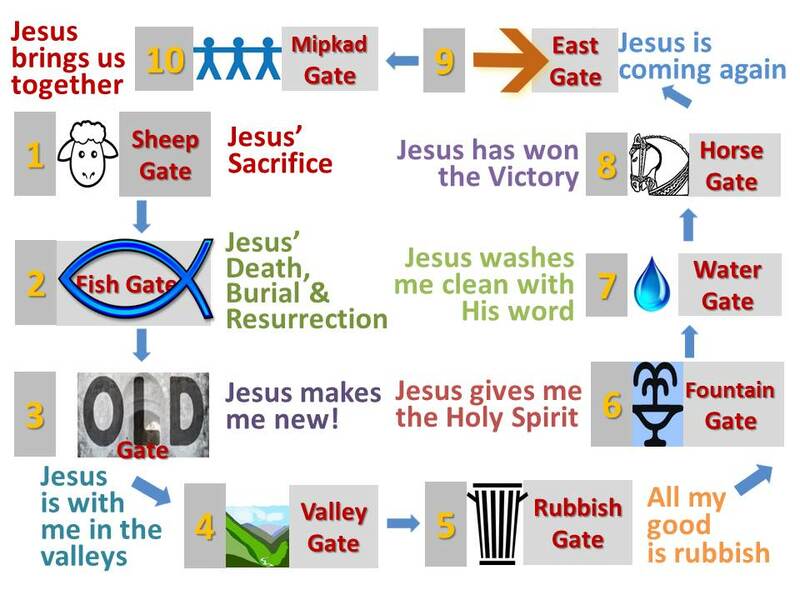 Basically, the kids should be able to know: Name of Gate and how it reminds us of what Jesus has done for us. For the older kids, you may want to up the ante by throwing in a memory verse or two. Please end with the Conclusion (important) and an invitation for those who have not received Christ to accept Him as their Lord and Saviour. Find the Gates: Hide cards with pictures representing each gate around the room. Have the kids hunt for the pictures. Then use the pictures to go through each gate and how they point to Jesus. Matching Game: Prepare 2 identical sets of 10 picture cards (each card has a picture representing each gate) and get the kids to match. Can be done in a relay style also, e.g. both sets of cards are mixed up in front (facing upwards); kids line up in 2 lines and take turns to run forward to find a matching pair. Memory Game: Have 10 large cards with pictures to represent each of the gates and another 10 large cards with text on how they point to Jesus. (large cards: so the whole class can see what’s on the cards). Arrange cards face down in a 4×5 grid (either on the floor or stuck on a board). Divide kids into 2 teams. Teams take turns to send a representative forward to open 2 cards and try to find a matching pair (e.g. 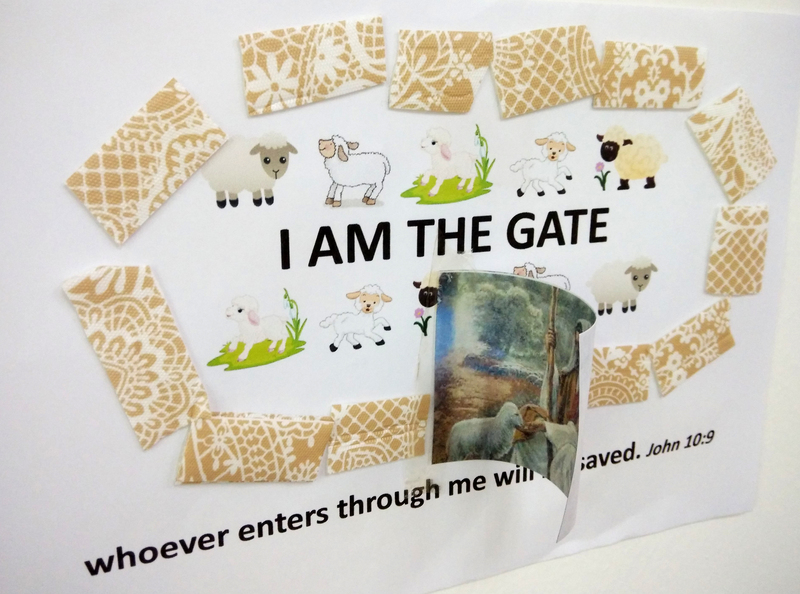 Sheep Gate picture card with “Jesus is the Lamb of God” text card). If a match is made, the cards are removed, and the team gets a point. If unsuccessful, the cards have to be returned faced down in original position for the next person to try. Team that gets the most number of matches wins. Scrambled Verse: Prepare 2 sets of scrambled memory verses, divide kids into 2 groups and get them to unscramble the verse. E.g. Horse gate: cut-out horse shapes, write a word of the verse on each of the horses, get kids to unscramble. Or for Fish gate: write each word of the verse on a paper fish with a paper clip attached; kids have to try to fish out the correct word to complete the verse. Duck, duck goose: Kids sit in circle. Choose a memory verse, and the chosen kid has to walk outside the circle and recite the verse while tapping each kid lightly as he says each word. When he reaches the end of the verse, the last kid has to stand up and chase him round the circle. The one who recited the verse will have to run a round and try to get to the empty spot in the circle before he gets tagged. 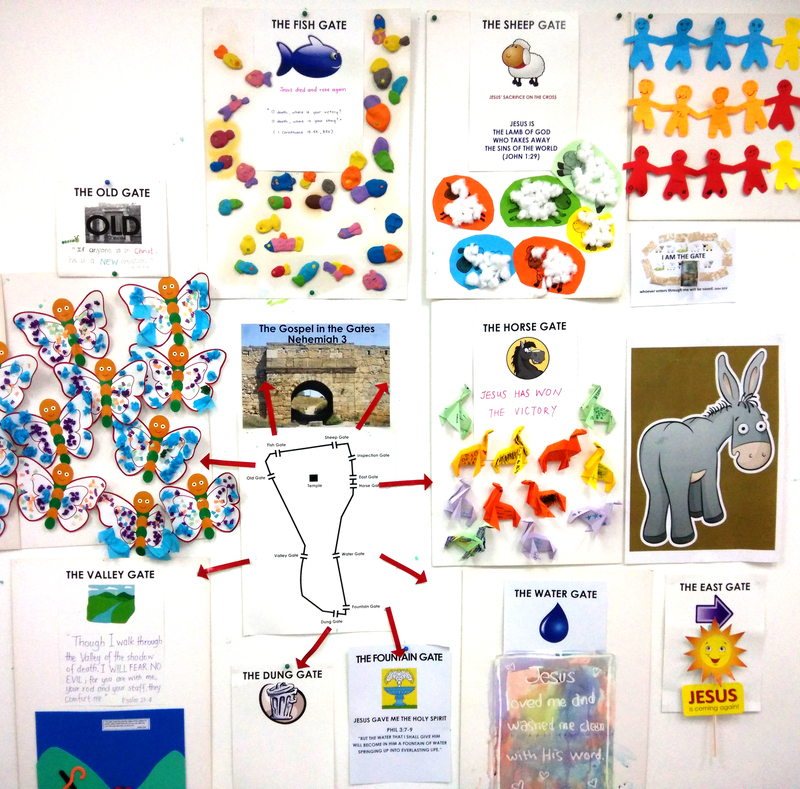 Create a wall: Divide kids into 10 small groups and assign each group a gate. Have them create a cardboard box (lots of ideas on the Net or you can just get ready-made ones) and decorate the box based on their assigned gate. Then assemble the boxes in a circle on the floor to resemble the walls of Jerusalem. Have the kids stand outside the wall and move from gate to gate as you do the review, beginning with the Sheep gate. At the end, talk about how Jesus is the gate through which we get abundant life (John 10:9-10). And invite the kids to step into the middle of the box circle if they want to accept Jesus as their Gate of Life — their Lord and Saviour. Lead them in prayer inside the circle. John 1:29 Jesus is the Lamb of God, who takes away the sin of the world! Phil 3:7-9 All my good are like rubbish compared to knowing Jesus. John 4:14 The water Jesus gives me will become a fountain of water that gives me everlasting life. Eph 5:25-27 Husbands, love your wives, just as Christ loved the church and gave himself up for her to make her holy, cleansing her by the washing with water through the wordor Jesus loved me and washed me clean with His word. Miphkad Gate (or Gathering Gate): Jesus gathers us together. Matt 18:20 For where two or three come together in my name, there am I with them. The Bible is a great big love story about how God loved us so much, He came down to die in our place so we can have new life in Him. The Bible points us to Jesus and His finished work on the Cross. Through studying the 10 gates of Jerusalem, we can see Jesus and what He has done for us. Jesus Himself said that He is the gate of life! John 10:9-10 I am the gate; whoever enters through me will be saved. They will come in and go out, and find pasture. 10 The thief comes only to steal and kill and destroy; I have come that they may have life, and have it to the full. Just like the sheep go through the gate to safety in the sheep pen, and go through the gate for food and nourishment in the pasture, when we come to Jesus, we have His protection and His provision for us! Invite kids to accept Jesus as their gate of life! Memory Verse activityJohn 10:9-10 I am the gate; whoever enters through me will be saved. They will come in and go out, and find pasture. 10 The thief comes only to steal and kill and destroy; I have come that they may have life, and have it to the full.